Is there a hotter young blues musician than Joe Bonamassa right now? We think not. In the past few years, the singer-songwriter and guitar virtuoso has set the world on fire with a dazzling array of solo releases and group albums with the megastar outfit Black Country Communion, all the while rubbing shoulders and trading licks with legends such as BB King and Eric Clapton. 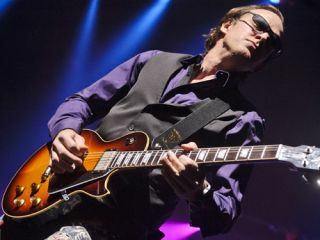 Bonamassa has just announced a UK arena tour for March 2012, and it's sure to be a sell-out. Tickets go on sale today, Friday, 7 October at 10am BST. On this tour, Bonamassa will be drawing upon selections from his current studio album Dust Bowl, plus songs from his vast catalogue of albums, including A New Day Yesterday, The Ballad Of John Henry, Sloe Gin, and Black Rock. In addition, Joe and his ace band (Carmine Rojas, bass; Rick Melick, keyboards; and Tal Bergman, drums) will preview new songs from a forthcoming studio album, which is due for release in May 2012. Tickets can be purchased from the following 24 Hour Box Office: 0844 249 1000, or book online from www.thegigcartel.com. For a free download of the single Dust Bowl from Joe's most recent album of the same name, click here.